Roller and screen shades from Hunter Douglas offer beauty and function, and they’re great for just about any room. To see if they might work in your space, contact a trained Treasure Coast Window Fashions consultant today. Both Designer Roller Shades and Designer Screen Shades are the perfect combinations of form and function. They are available in a wide variety of colors and styles, so they can fit nearly any décor. Plus, these shades control heat in the summer and cold in the winter. 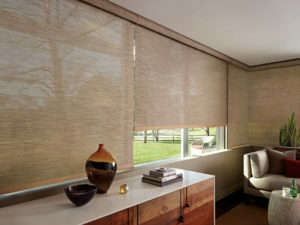 In addition, these incredible shades come with high-performance fabrics that go beyond the standard screen and roller shades. These fabrics reduce glare and control natural light while providing UV protection for your furnishings. When selecting the lifting system for your roller or screen shades, consider your furniture placement, child and pet safety, and window placement. See how each of the following lift systems operates. Perfect for child and pet safety, the UltraGlide® lift system has a single retractable cord that remains the same length whether you are raising or lowering your shades. For even more enhanced child and pet safety, the cordless LightRise® lift system is a top choice. This system allows you to operate the shade by simply lifting the bottom of the shade to raise it and pulling it down to lower. The standard lift system for roller and screen shades, the Custom Clutch system has a continuous beaded cord loop. Simply pull the cord to raise and lower the shade. For the cream of the crop, look to PowerView® Motorization. It is the ultimate in luxury and child and pet safety. Plus, PowerView features battery-powered wireless control that allows you to use a variety of control devices including our designer PowerView® Pebble® controller. Treasure Coast Window Fashions provides more than just the finest window coverings. Our owners are involved in every project from start to finish to ensure your window covering project exceeds your expectations. We’re proud to serve the greater West Palm Beach area including Jensen Beach, Ft. Pierce, Hobe Sound, Hutchinson Island, Indiantown, Jupiter, Jupiter Island, Lake Worth, North Palm Beach, FL and surrounding areas.